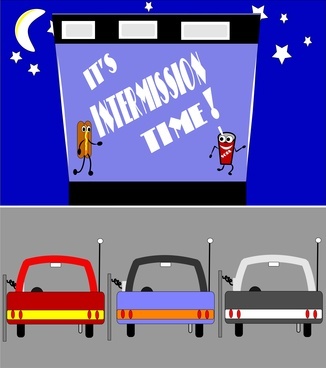 In plays or concerts (or at the drive-in movie, like in the image on the left) there’s often an intermission. It gives the audience a chance to get up and stretch their legs or maybe get a treat to eat before going back into the theatre. In England, there’s often ice cream sold at a little stand right in the theatre auditorium. That seems like a good idea to me! It also gives the performers a chance for a bit of a rest in between acts of a play, or sections of a concert. Here at the Starborn Revue we’re going to take a long intermission for the months of June, July and August. During those months you’ll be enjoying time off from school, maybe going on a vacation trip, maybe even going to theatre or music camp. The theatre cats and I will be planning all kinds of cool things for the next season in the Starborn Revue. We’ll see you back here on stage in September!